By Deputy Chief D. Edward Ferguson, Jr.
Goochland County Department of Fire-Rescue & Emergency Services urges everyone (and their pets) to stay off of frozen ponds and lakes. The ice isn’t thick enough to support the weight of a person. Rarely does it get cold enough for a long enough period of time in this area for the ice to become strong enough to support the weight of a person. 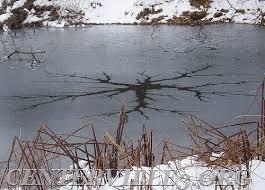 Parents, please remind your children to stay off the frozen water! Dog owners must be careful around frozen water and not throw sticks or balls onto the ice. Should a dog go onto the ice and get into difficulty, don't attempt to carry out a rescue. If a pet or person gets in trouble on the ice on a frozen pond or lake, call 911 immediately!